Welcome! We’re Michael and Ellen, a couple of stay-at-home parents living in northern Colorado. We achieved financial independence at 33 and retired* at 36. Now, we’re raising our two young children and getting involved in passion projects—like this website. We’ll share a bit about us below, but let’s start by introducing the site. What is the Uncommon Dream? The Uncommon Dream is the dream pursued—the dream met with planning, action, and sacrifice. With just a dream and those three tools, you can accomplish almost anything. A plan illuminates your path and clarifies the actions you can begin taking to work toward achieving your dream. We all know this much. But that last ingredient—sacrifice—could receive a little more of our collective attention. The prevailing tendency is to overcommit to the unimportant, spending our time, energy, and money on things that often don’t bring us much happiness or any closer to living our dream. Instead, we choose to simplify our lives by identifying the few things that matter to us most and eliminating the rest. In doing so, we gain more freedom and control over our lives. And by consciously choosing to do and consume less, we save money and have more time and energy to make meaningful contributions in the areas of our lives we care about the most. Organize and share some things we’ve learned – It would be deeply satisfying to hear our writing has helped you in some small way. Learn and grow – We have no delusions that we know it all. We look forward to becoming better versions of ourselves by learning from you. Simply writing these articles leads us into great conversations and helps us think more deeply about these topics as well. Meet kind, creative, supportive people who share some of our values and passions. The pursuit of almost any dream can benefit from decreasing distractions and increasing your financial freedom. As such, we’ll write primarily about minimalism and the pursuit of financial independence. We’ll also explore topics ranging from happiness and productivity to travel and entrepreneurship. Really, we’ll write about anything we believe might foster beneficial discussions and support you as you pursue your dreams. We’re only just getting started, but we have ideas for well over a hundred articles. New ideas for posts are coming to us faster than we can write them down so we’ll be at this a while and hope you’ll join us. To make sure you don’t miss new posts, you can subscribe via RSS or email. Ellen and I met in early 2004 while we were both spending several months in Mexico studying Spanish. Between the two of us, we’ve traveled to 23 countries and have lived abroad nine times. 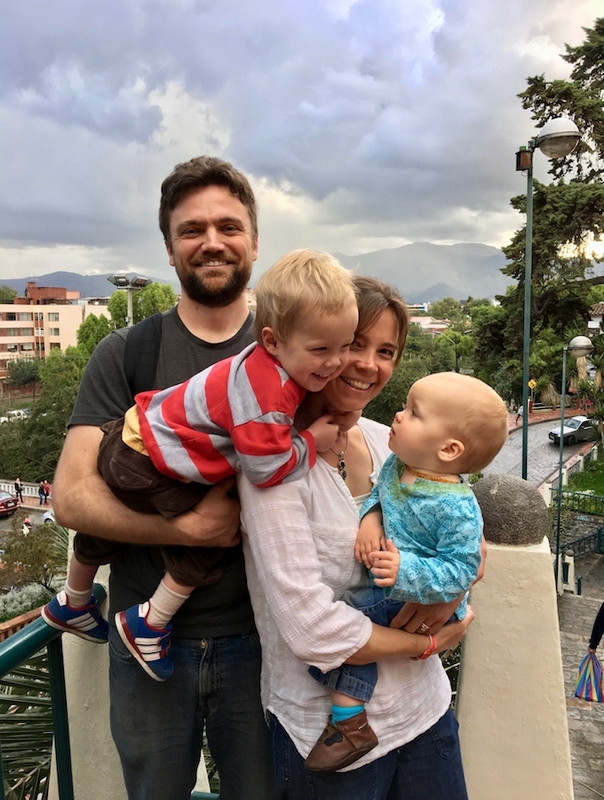 As I write this, we’re spending three months in Ecuador with our two young children. Periodically living abroad is the best ways we’ve found to refresh our perspective and slow down our perception of time. We always meet fascinating people and enjoy experiencing new places. We also gain a newfound appreciation for the familiar people and places we return home to afterward. After being vegetarian for years, we both decided to go completely vegan in 2006 after reading The China Study. We’ve attended a few plant-based nutrition events and have even met a few of our heroes including Dr. Michael Greger, Dr. T. Colin Campbell, and the competitive bodybuilder Robert Cheeke. But by far our biggest claim to plant-based food fame is having the curator of PlentyVegan.com refer to us as her friendspiration for becoming vegan. Okay, we know…if you have them, YOUR kids are probably the cutest! Bias aside, we are so proud of the sweet, intelligent, inquisitive and loving little beings that are our children. We are grateful to be their parents and cherish our moments together as a family. Let’s be honest though, we’ll never truly be retired until these two kids grow up and move out of the house! Throughout my later high school years and early college years, I taught Youn Wha Ryu style martial arts, an early mixed martial art that preceded today’s MMA craze. I led 15-20 classes per week and had the opportunity to frequently compete in, help organize, and officiate martial arts tournaments around the country. While this was rewarding work in a lot of ways, financially wasn’t one of them—I earned about $75 per week initially and worked my way up to around $125 per week in the later years. I lived at home to keep costs down so this was enough to buy textbooks, gas, and the occasional meal out with friends. Needless to say, my savings at that point were pretty minimal. I saved $35,000 in the seven months before my last semester of college. In my later college years, I also worked full-time as a retail manager earning around $35,000 per year. With my undergraduate degree winding down, I set my sights on a year-long post-grad program in Florida. However, the tuition alone was $30,000. My parents were gracious enough to pay for my undergrad tuition but made it clear to my siblings and me that the cost for any further education was on us. I didn’t want to take on any student loan debt so I did what anyone with the energy of an early 20-something and an audacious goal might do. I took a semester off of college and took on a second full-time job working in pro audio. Since I wrote the schedule at my first job, I figured I could just write it around the schedule at the second job. I worked 90-100 hours per week for seven months straight without a day off and saved $35,000—enough to cover my post-grad studies. There was just one problem though. This was real money for a 23-year-old and I was keenly aware of the physical sacrifice I’d just made to earn it. I’d also started learning about compound interest. It was clear to me that time was on my side. I decided one degree was plenty and realized if I instead plowed that money and a significant share of my future earnings toward retirement savings, I could realistically be financially independent in my early thirties. Like many, I reminisce about hot summer days spent running around the neighborhood free to build forts, play games, and swim in the neighbor’s pool. My parents made sure to carve out at least a couple vacations per year to load our family into a stick-shift minivan (yep, that’s right… manual transmission. My dad swore it gave him better mileage). We’d tour the country’s sites, staying in our small popup camper. As an adult, I looked for a job in Washington state specifically because I wanted to be near mountains, trees, and water (Washington has plenty of all three). Once in Texas, as much as I loved my job, neither Michael nor I could shake the daily drag of living in a place with very little access to nature. After much debate, we settled on Colorado as our destination, and when we got pregnant with our second child, we finally had a clear line in the sand—move before she was born or maybe never move at all. Seven months pregnant and with an active 19-month-old in tow, we moved to what we believe will be our forever home, backdropped by the majestic Rocky Mountains. Now, I find myself with a strong urge to pack up the family and head out on the road in a popup camper. I worked as a fourth-grade bilingual teacher in a small town located on the Puget Sound in Washington State. I adored my students and loved the work, but we ultimately decided to move to Texas for Michael’s job. I grew up with a large backyard garden that I (often reluctantly) helped my parents tend. Despite the hard work, nothing beats fresh sugar snap peas right off the vine—especially on your way through the hole in the hedge that leads to your best friend’s back yard! After moving to a different house with too much shade, I missed having the garden and the fresh vegetables it produced. After teaching for several years in Washington state, we decided to move to Texas so Michael would no longer need to travel for his job. Instead of looking for another classroom position, I wanted to get involved in something that somehow connected students with their community and nature. I was fortunate to find a job with the organization REAL School Gardens. Now a national nonprofit (I helped grow the pilot program in Fort Worth), the organization partners with elementary campuses to design and install outdoor classrooms and then provides individualized training to the school’s staff so that the outdoor classroom is used for rigorous and authentic instruction across the subject areas. Although my position was more focused on education than gardening, I learned a great deal about horticulture while there. Now, at our home in Colorado, I cultivate the small veggie plot we have, with plans to expand the space as time and toddlers allow. Hands in the soil is so good for the soul – there’s even research to prove it. I think it’s typical for people to assume that eating a plant-based diet is hard to do and that the food is likely devoid of flavor. Not true on either account! I love preparing tasty, healthy meals for my family. I get a lot of inspiration following vegan, whole food plant-based, and raw food accounts on Instagram. Yum! *We’re not particularly comfortable yet with referring to ourselves as early retirees even if that probably best explains our status. Although we’ve left our full-time jobs, we both enjoy working and will likely always do so in one way or another. Right now, that looks like parenting, working on this site for you, and doing a few hours of paid consulting from time to time.